Argweld® Pipe Purging Plugs are used on smaller diameter (1/2” to 6”) and shorter length tube or pipe applications. Great for sealing outlets when purging vessels, as low pressure test plugs for pipe joints, or to stop contaminants from entering tubing. Made from high quality nylon, these plugs won’t rust or corrode, are virtually shatter proof, and resist many chemicals. Argweld® Pipe Purging Plugs are used on smaller diameter (1/2” – 6”) pipes, tubing, fittings, and in applications where purge bladders or purge film can not be utilized. These plugs are great for sealing outlets when purging, pressure testing pipe joints, or for FME purposes (keeping contaminants out of pipe). They are made from high quality nylon and won’t rust or corrode, are virtually shatter-proof and resist many chemicals. 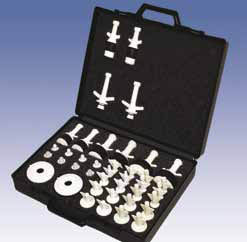 The popular Purge Plug Kit offers multiples of each size from 1/2” – 4” in a custom foam-lined carrying case. These plugs are also offered up to 36” in Aluminum. The Expanding Purge Plugs can be used on small diameter pipe work where conventional pipe purging devices are not suitable and on pipe work fabrications where there are a number of branches and ends to seal. 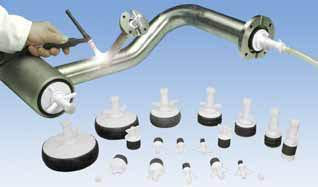 Hollow shaft plugs come with a sealing end cap with internal rubber seal as well as a hose connector tailpiece and nut for connecting a gas inlet hose or vent hose. Each plug comprises a center shaft over which are two compression plates. Between the compression plates is a natural rubber ring which is expanded by means of a wing nut on the shaft, which when tightened closes the two plates and compresses the rubber ring seal between them to seal the plug tightly inside the pipe or hole. The plugs are fully demountable for cleaning purposes and the shaft has an ‘O’ ring seal as well as a locking keyway to ensure re-assembly is positive and leak tight. We provide expert industrial solutions to businesses. With over 35 years of experience we’ll ensure that you’re always getting the best results from an award-winning US company focused on quality. © 2016 COB Industries, Inc.